From load in Wednesday to the end of the day today, everything was pretty chill. Artist Alley seemed to double in size and was super packed even while half of them were still setting up. For the quietest day of the Expo, I suspect everyone had a busy day of sales and hangouts. We had all kinds of meetups, greetings and hangouts between prize delegates of the Rue Crew (Ron and Tobin), Dreadful Tales (Colum and Jason), Scream All You Want, Adam Tupper, Johnny Pints and a few others. A huge day saying hello to everyone and greeting the first wave of humans. The first image is Wednesday, then today as everyone was booted out at 9:00 p.m.
Today we featured authors. While not a lot of time was spent tooling around taking photos, I attended the Indie Genre Fiction panel hosted by Monica S. Kuebler with authors Sass Cadeaux, Stephen Pearl, Karen Dales and Alan Draven. Tomorrow I will be swinging by Draven's table to catch up as he is from Montreal and a huge Halloween fan ~ gotta love that. We had a Michael Myers sighting, and saw a very well-done Leatherface along with a radtastic Ghost Rider. Through the next few days we'll be chasing them down and holding out for a Pyramid Head or two. I know, it's an illness! 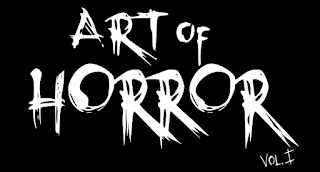 Horror Punk day at Ottawa Horror tomorrow! Frightlight will be hanging out from 11 to 3 with tickets to see them open for the Misfits October 25 in Toronto, shirts, CDs and Northern Ontario style mayhem!